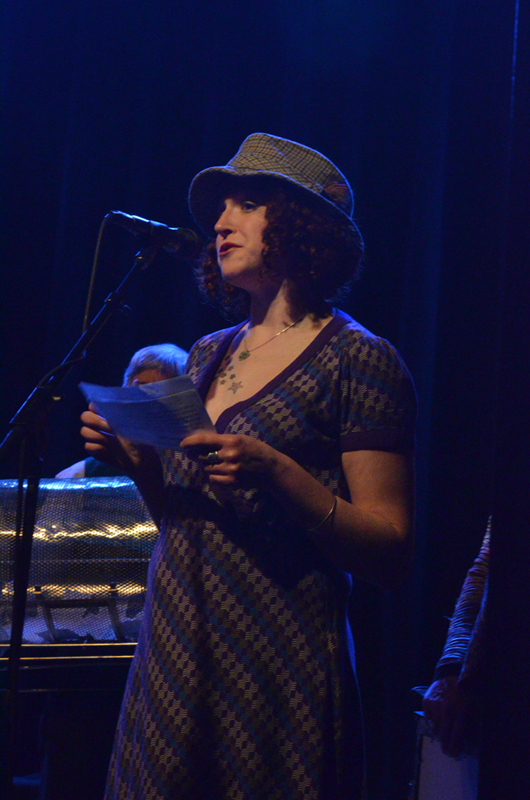 Winterfolk is one of those rare expressions of giving which brings disparate parts of a region together, in the common cause of music and a sure knowledge that every dollar raised at the door goes to the people it is intended to help. 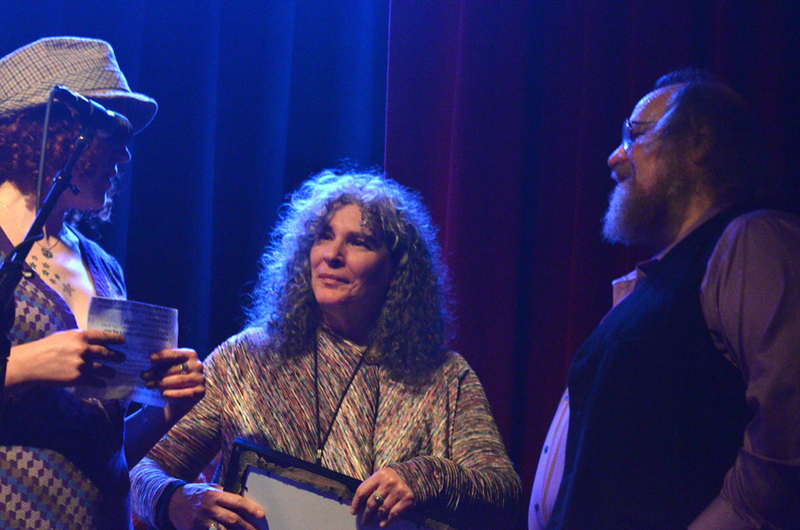 All of the artists, national or locally based, completely donate their services; one of the truly unique elements of this yearly event that benefits Sisters of the Road Café. Sisters of the Road Café quietly continues to do its work of providing low cost and no cost meals in Portland, Oregon’s Old Town area. Founded nearly 40 years ago, it remains a shining example of reaching out and helping to change people's lives, one hot meal at a time. In 2019, Winterfolk's beneficiary became another incredible organization who serves the homeless community transition from the streets to permanent housing named JOIN. Tom May is the founder and artistic director of Winterfolk. 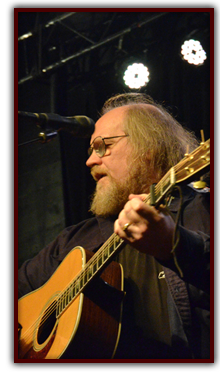 Winterfolk began as a birthday party for one of Tom’s fans in 1988, who flew him out from his home at that time - Omaha Nebraska, to perform for her at Portland’s Horse Brass Pub, owned by Tom’s pal Don Younger. A collection was taken up for the homeless, and Winterfolk was born. The next few years saw the event expand to an all-day Sunday celebration at the Horse Brass, who has remained as an event sponsor ever since the beginning. Winterfolk has had wonderful sponsors over the years. In addition to the Horse Brass Pub, Music Millennium has been involved with the concert almost since its start. In recent years Sysco and other angels have made cash and in-kind contributions to keep the spirit of Winterfolk alive. Click here to see our Winterfolk sponsors. Sisters of the Road Café became partnered with the event in 1990. In 1994 the annual concert moved its home to Portland’s Aladdin Theatre, where it was held for a number of years until 2016, when it moved to the Alberta Rose Theatre, where it is presently held. 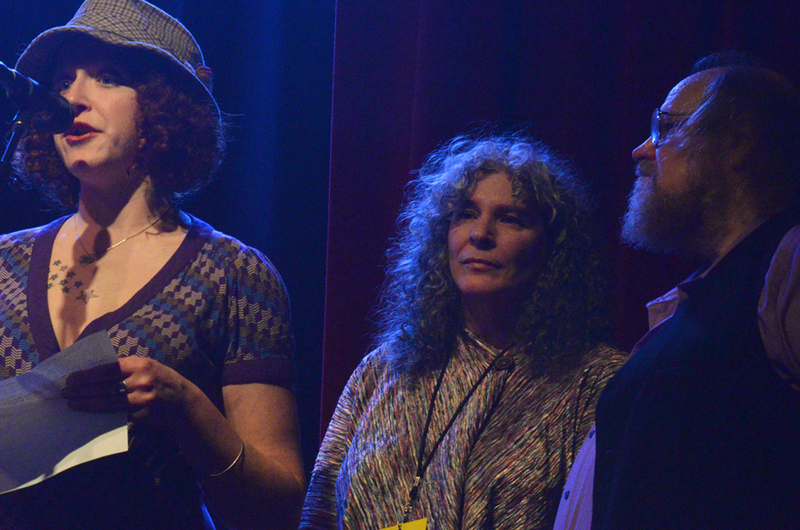 Winterfolk has become Portland’s largest annual folk music event. 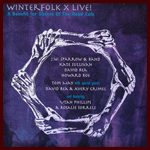 So far, there have been 4 Winterfolk Live Recording CDs. Winterfolk X, recorded live at the Aladdin Theater in Portland, was recorded on February 7, 1998, for the 10th Anniversary of this special event. It features some rare and wonderful performances (which you can listen to) from Tom May, Utah Phillips, David Rea and more. 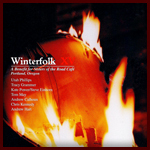 Winterfolk XV was recorded live at the Aladdin Theater in Portland, OR on February 1, 2003, and features great performances by Tracy Grammer, Tom May and more. 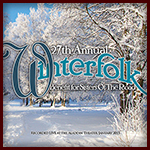 Winterfolk 22 was recorded live at the Aladdin Theater in Portland, OR on February 6, 2010, and features great performances by Peter Yarrow, Tom May, Leela Grace, and more. 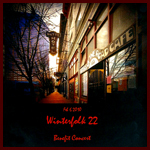 And the most recent live CD, Winterfolk 27, was recorded live at the Aladdin Theater in Portland, OR on January 31, 2015, and featured Bryan Bowers, Kate Power & Steve Einhorn, and more. Click on the following CD covers, and you can see each album's artwork, read the liner notes, listen to several very rare recordings of the songs, and purchase a copy of Winterfolk XV for your very own! 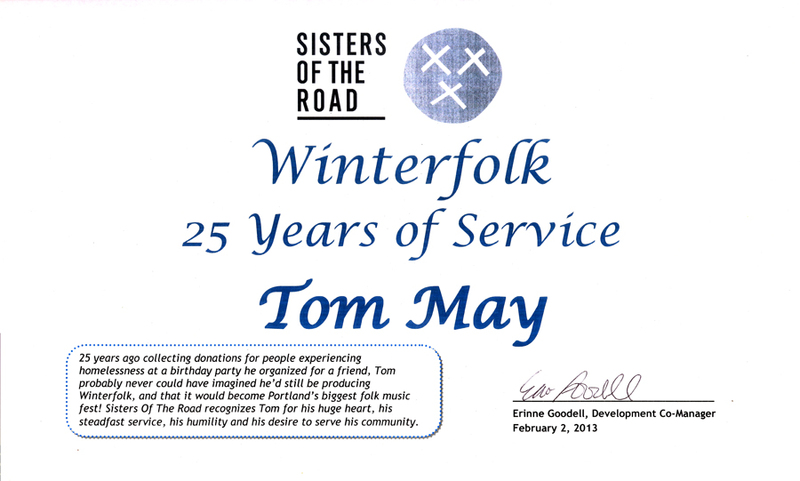 2013 marked the twenty-fifth year of Winterfolk. 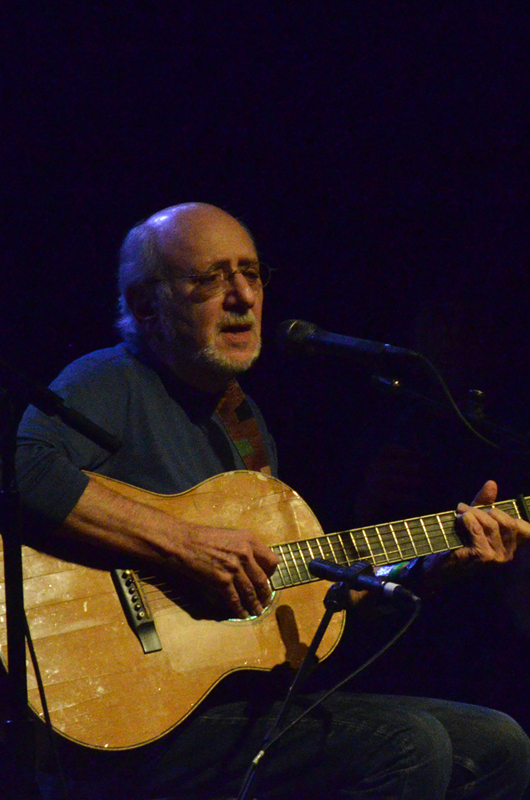 This very special evening was headlined by the legendary Peter Yarrow (Peter, Paul & Mary.) 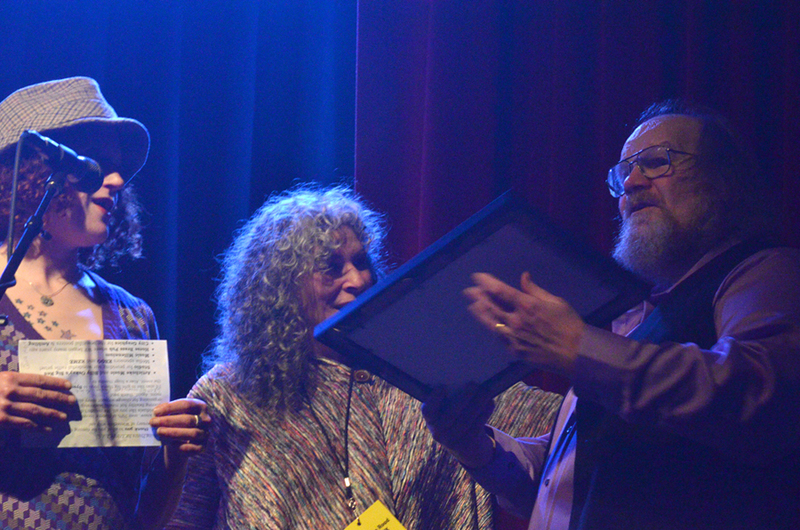 Tom May was honored for his dedication over the years, with a moving presentation by Sisters of the Road, represented by Erinne Goodell and Brenda Morgan. Click on the following thumbnails to see some pics of the presentation.